ALKELD (ATHILDA), there are two churches in Yorkshire dedicated to this saint about whom nothing is known save for an ancient painting showing St. Alkeld being strangled by Danish pirates. This event may safely be dated to the tenth century. AMATOR (AMADOR), (Date Unknown), several churches dedicated in Portugal are dedicated to this hermit of whom nothing is known. AUGUSTA, (Fifth Century), the daughter of the pagan Teutonic Duke of Friuli, who upon learning of St. Augusta’s becoming a Christian, was so angered that he personally beheaded her. PHILETUS, LYDIA, MACEDO, THEOPREPIUS (THEOPREPIDES), AMPHILOCHIUS, and CRONIDAS, St. Philetus, a senator, his wife St. Lydia, and their children SS. Macedo and Theoprepius, were martyred in Illyria circa 121. Martyred along with St. Philetus and his family were SS. Amphilochius and Cronidas both high ranking officials. Apostle of Bavaria and Austria. ROMULUS, an Abbot of St. Baudilius Abbey near Nimes. When the Sarasens invaded the area, St. Romulus and his community fled, settling in the ruins of a monastery in Saissy-les-Bois, which they proceeded to refurbish. St. Romulus reposed circa 730. RUPERT (ROBERT), Apostle of Bavaria and Austria. St. Rupert was a French royal who was consecrated Bishop of Worms and commenced to evangelise the south of Germany. Beginning at Regensburg, St. Rupert worked his way south, settling in the ruins of Iuvavum which had been given to him by Theodo, Duke of Bavaria (†c. 716). There St. Rupert built a monastery for men and one for women where his sister (or niece) St. Ermentrude (30th June) served as first Abbess. These laid the foundation of what came to be Salzburg, Austria. St. Rupert established his See there, and was the first Bishop of Salzburg. St. Rupert reposed circa 717. SUAIRLECH, an Abbot of Fore Abbey in Co. Westmeath, Ireland. He was known for his zeal, and later consecrated first Bishop of that See. St. Suairlech reposed circa 750. CASILDA, a Moor who converted to Christianity. St. Casilda lived an hermitic life near Briviesca in present-day Castile and León, Spain. She reposed circa 1050. DOTTO, (Sixth Century?, in De Scotorum Fortitudine (his Scottish Menology), Camerarii (Roman Catholic Priest and Educator David Chambers †1641) lists St. Dotto as the abbot of a monastery in the Orkney Islands off the northern coast of Scotland. According to Scottish Episcopal Bishop and Scholar, The Rt. Revd. Alexander Penrose Forbes' (†1875) Kalendar of Scottish Saints and English Roman Catholic priest and renowned hagiographer Fr. Alban Butler's (†1773) Lives of the Saints the monastery was on an island (Forbes states one of the main islands) named for the saint, whom Butler claims to have lived for nearly one hundred years. However, in the Acta Sanctorum the Bollandists point out there is no mention of an island by the name Dotto on any map or in any history of the Orkneys of the last few hundred years. The Bollandists go on to state that there is no mention of this saint in either Scottish Scholar and Academic Thomas Dempster’s (†1625) Menologium Scoticum , or in the Aberdeen Breviary , thus casting doubt as to St. Dotto's very existence. However, his veneration has survived, at least in a limited form, to this day. HEDDA, THEODORE, and COMPANIONS, also known as the Martyrs of Croyland, St. Hedda was Abbot of Peterborough, St. Theodore was Abbot of Crowland, they were martyred along with at least eighty other monks from these and surrounding monasteries by the Danes circa 869. Also, included in this group is St. Torthred (Touredec), to whom a church in Brittany is dedicated; St. Elfgete, a deacon; St. Sabinus, a subdeacon; SS. Askega, Swethin, Egdred, Ulric, as well as SS. Grimkeld and Agamund, who were both centenarians. HUGH of ROUEN, he received monastic tonsure at the Abbey of St. Peter / abbaye Saint-Pierre (later the Abbey of St. Wandrille / abbaye Saint-Wandrille) in Fontenelle, Normandy (France) whilst still a youth. Later St. Hugh was appointed Vicar-General of Metz (north-eastern France), then in 722 consecrated Bishop of Rouen (Normandy, France). Later he was translated to the Diocese of Paris, concurrently serving as Abbot of both Fontenelle and the Abbey of St. Peter of Jumièges (abbaye Saint-Pierre de Jumièges — Jumièges Abbey) in Normandy. St. Hugh resigned his offices to live as a simple monk at Jumièges. St. Hugh reposed in 730. MADRUN (MATERIANA), (Fourth Century), St. Madrun was a native of either Wales or Cornwall. Two churches in Cornwall and one in Wales are dedicated to her. Nothing further is known of this saint. MARCELLUS, the successor of his brother, St. Petronius (10th January), as Bishop of the Diocese of Die in south-eastern present-day France. During his long episcopate, St. Marcellus endured a great deal of torment from Arians. He reposed in 474. MARTYRS of NORTH-WEST AFRICA, (Date Unknown), a group of Christians martyred in North-Western Africa, most likely Mauritania Tingitana (roughly the northern part of present-day Morocco). 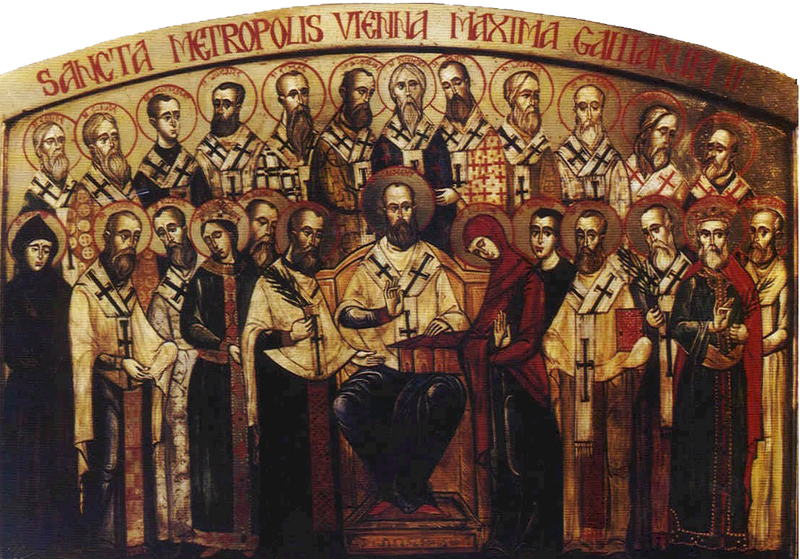 MARTYRS of PANNONIA, (Date Unknown), seven Christians said to have been martyred in Sirmium, Pannonia (present-day Sremska Mitrovica, Serbia). However, contemporary research has been unable to find any evidence of their existence. WALDETRUDIS (VAUDRU), a daughter of SS. Walbert (11th May) and Bertilia (3rd January), wife of St. Vincent Madelgarus (20th September) and mother of SS. Landericus (10th June), Dentelin (16th March), Madalberta (7th September), and Aldetrudis (25th February). Both St. Waldetrudis and her husband longed-for lives devoted completely to prayer and meditation, and so, St. Waldetrudis convinced St. Vincent to enter a monastery, and she followed two years later. St. Waldetrudis was the foundress of a community around which the town of Mons, Belgium, grew up. There St. Waldetrudis lived as a simple monastic, spending her days in prayer and meditation, she reposed circa 688.